Amidst this landscape, a quiet but critical effort has laid tracks: The National Standard Practice Manual (NSPM). 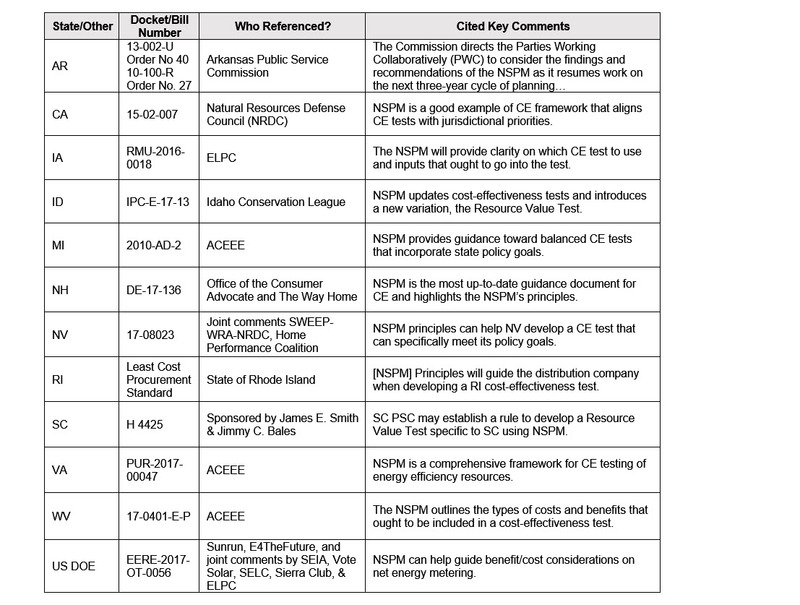 Offering a new way for states to think about assessing energy efficiency’s cost-effectiveness, the NSPM also broadly addresses other distributed energy resources. Published in May 2017, the NSPM has made its way into select stakeholder, regulatory, and legislative discussions and forums around the country. 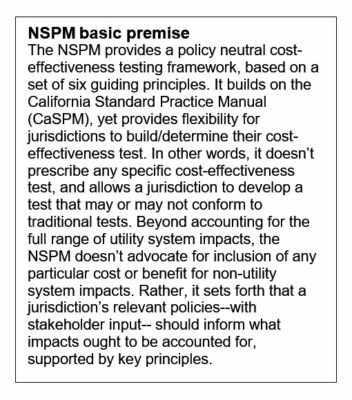 At its core, the NSPM provides a framework and set of principles to help guide decision makers in cost-effectiveness assessment. In the big scheme of industry evolution, clear frameworks and sound economic principles are essential to guiding decisions amidst all the noise. This is particularly relevant as resource silos, in particular for EE and other DERs, are moving toward greater integration. Frameworks that help to level playing fields–and that provide consistent comparisons across resources–are essential to ensuring state policy goals. After a year of extensive outreach on the NSPM including a briefing with commissioners at NARUC’s Policy Summit, trainings, and many conference sessions, we’re excited to see NSPM appearances increasing in frequency. Examples of key references to date are provided in a table below. 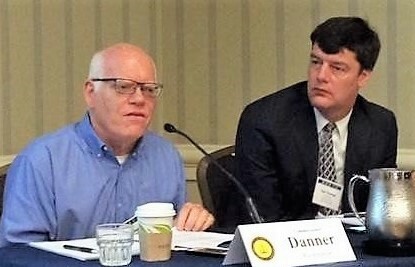 Commissioners (Chairs) David Danner (Washington UTC) at left, and Ted Thomas (Arkansas PSC) at the NARUC 2017 Summer Policy Summit NSPM briefing. In 2018 we will continue to monitor states’ interest, referencing and use of the NSPM, and will provide updates on the outcomes of public comments and recommendations. Check out the NSPM References on the Resources page for monthly updates, and please share any developments with us at NSPM@nationalefficiencyscreening.org. You are also invited to reach out to us with questions. • A scoping effort for expanding the NSPM to address DERs. I feel encouraged that in just six months, the NSPM has gained significant attention. We applaud and extend thanks for the collective work of the NSPM co-authors, with support and outreach from national, regional and state stakeholders. Their work led to a growing awareness and understanding of the NSPM. So, cheers to 2017’s accomplishments . . . but substantial work is ahead to further educate, and to develop additional resources and provide technical support to states. I look forward to working with the many interested parties next year to advance the use of — and improvements to — the NSPM, with the ultimate goal of reaching the tipping point where the NSPM serves as the prevailing cost-effectiveness testing guidance for our industry. This post was updated 12-18-17 11:00AM due to an addition to the summary table.